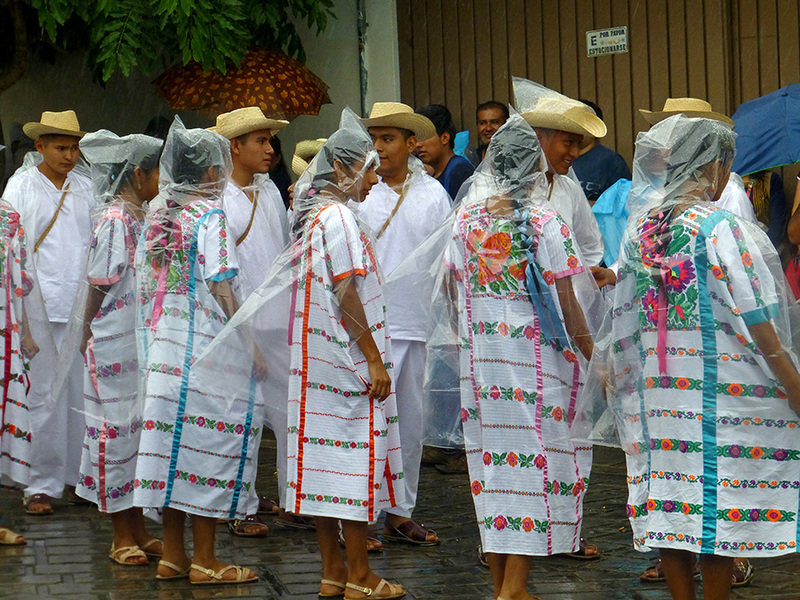 This evening, the rain began falling as the delegations for the first Saturday Guelaguetza desfile began gathering. Are we having fun, yet? However, just like last year, the show must go on and the dancing must be done. Some even looked like they were having fun. Of course, they were well covered! I wasn’t, so this wimpy gringa headed back to her casa and a glass of wine (insert smiley face). By the way, to add insult to injury, tonight’s press is reporting that the route was changed — and it wasn’t just me who was clueless. 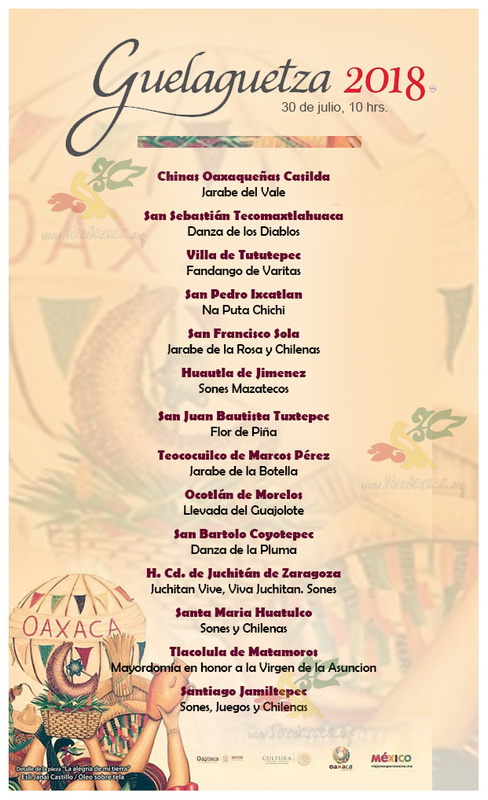 Ahhh… Oaxaca!!! 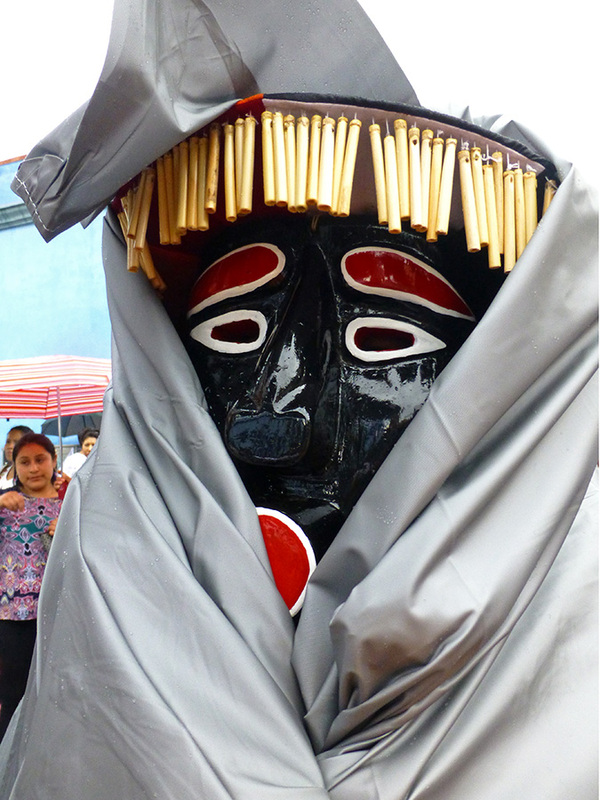 Yesterday, as the Guelaguetza dancers gathered at the Cruz de Piedra and Conzatti Park waiting for the desfile (parade) of delegations to begin, the sky darkened, thunder rumbled, lightening flashed, the wind picked up, and the rain began falling. 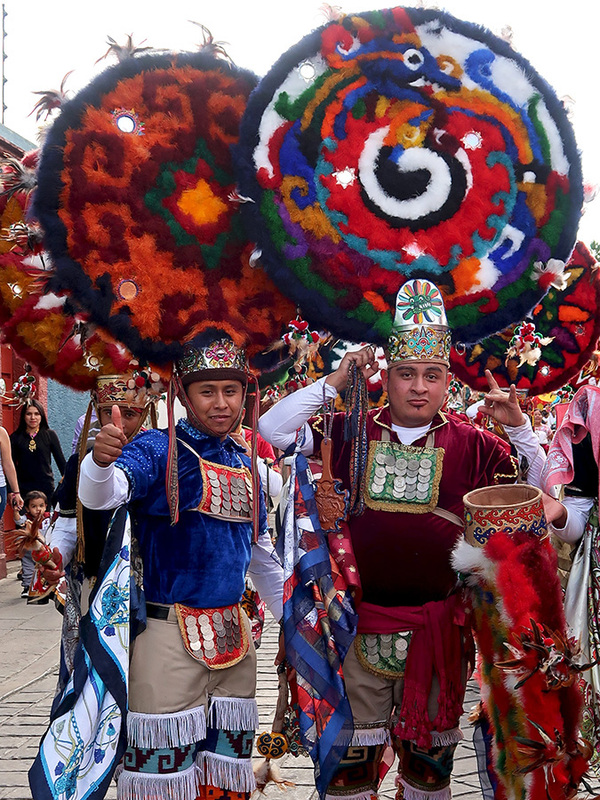 While they may be making their first appearance (in recent memory) at the Guelaguetza, the Grupo de Danza de Pluma Promesa from Teotitlán del Valle came prepared. 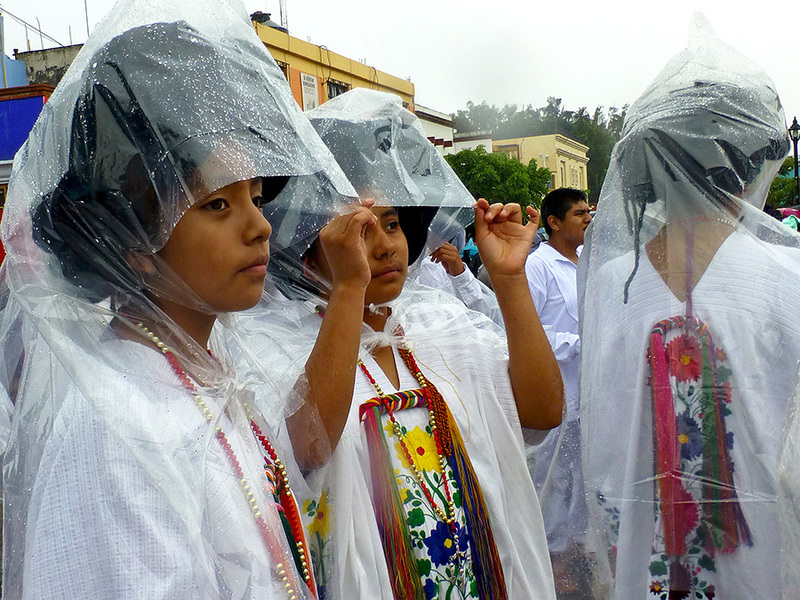 They donned rain ponchos and covered their penachos (headdresses) with clear and specially sized plastic bags. They were good to go! 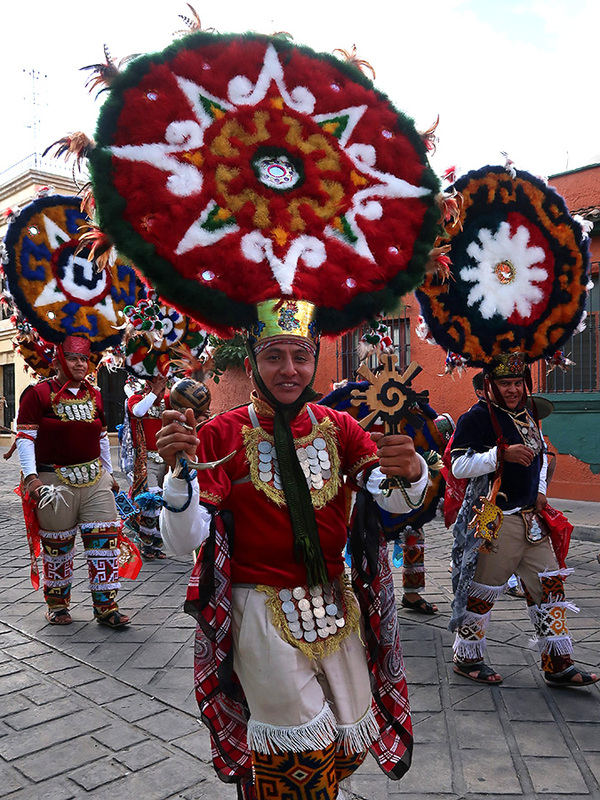 Dance master and choreographer extraordinaire, Javier Gutiérrez Hernandez, must have hauled his old costume out of storage to fill in for one of the danzantes. But he looked stoked! I’m not sure which Subalterno this is. Florentino Martínez Ruiz is that you? Or, is it Juan Bautista Ruiz? 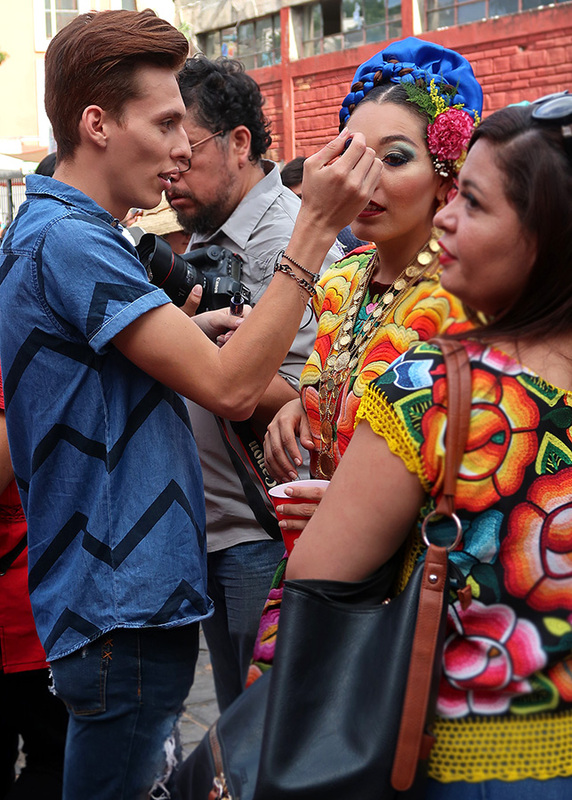 Before and during the desfile, both clowned around a little and assisted the danzantes a lot. 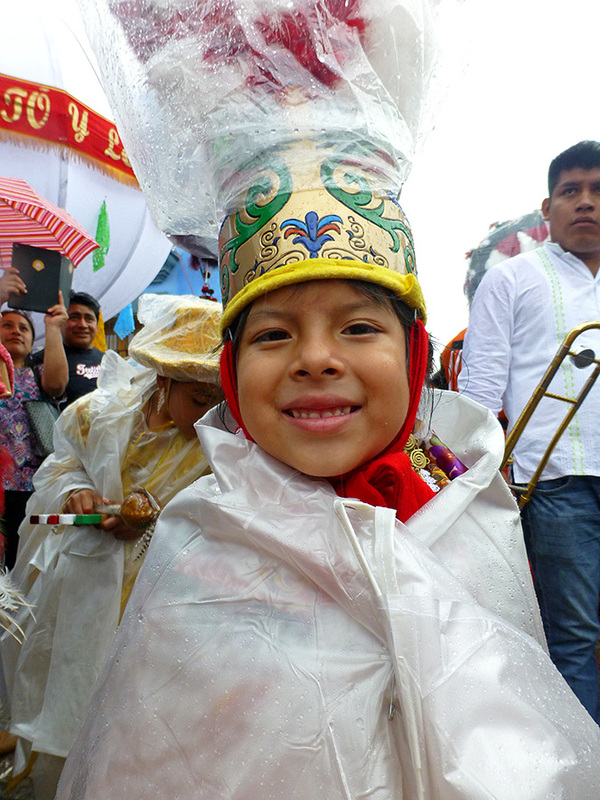 There is something about kids and rain… Five year old, Quetzali del Rayo Santiago Ruiz (Malinche) looked happy as a clam. 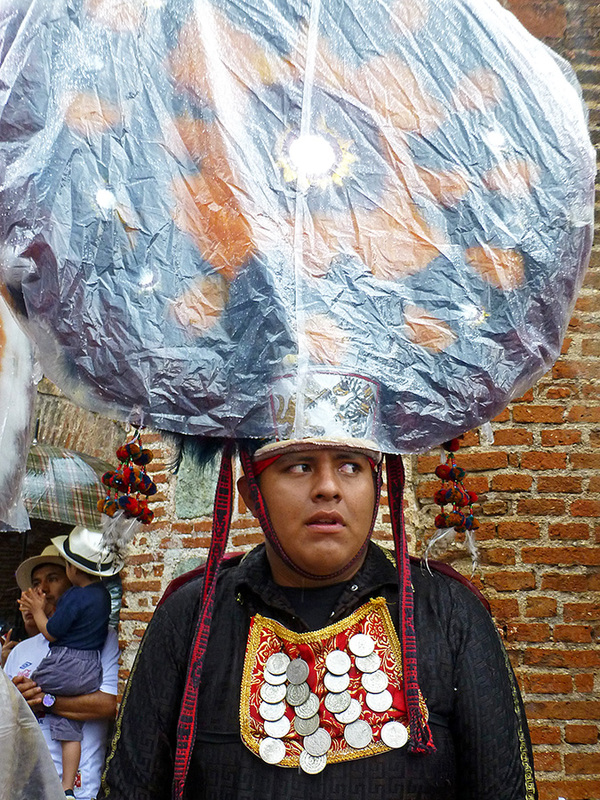 Perhaps there was a little trepidation among the danzantes at the conditions and concern if the desfile was really going to happen. 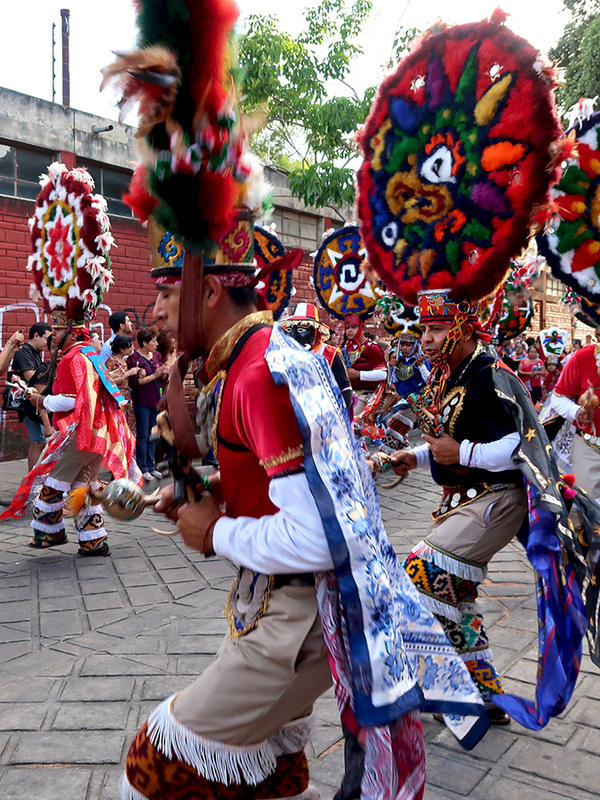 However, at almost exactly 6 PM, police sirens sounded, the leading band struck up, and the parade of Guelaguetza delegations began dancing their way through the city’s rain slicked streets. 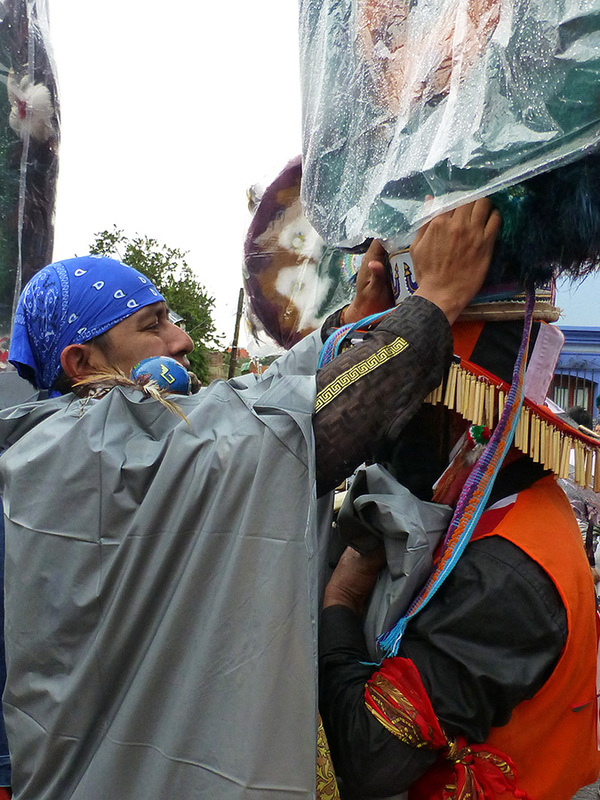 Not long after it began, the torrential downpour subsided and the plastic began coming off the danzantes penachos. 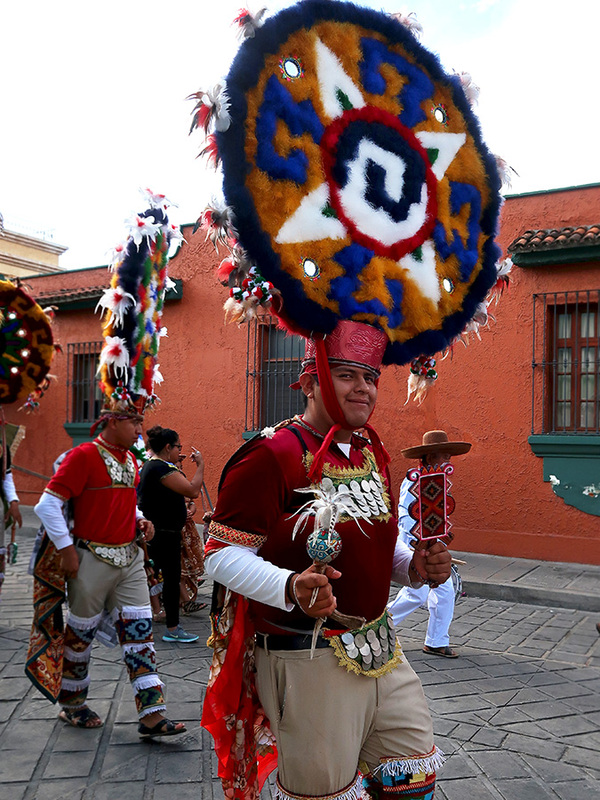 After 35 minutes of dancing through, what became, a light drizzle, they reached the intersection of Crespo and Morelos, only a half a block from the parade’s end at the Plaza de la Danza. 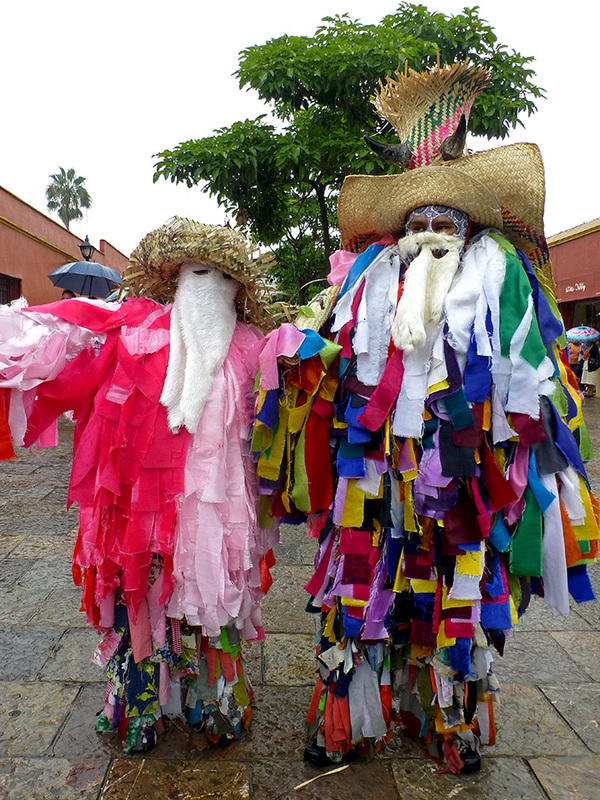 Next on their dance card, Monday evening’s Guelaguetza performance! I’ll be watching on the local CORTV station. 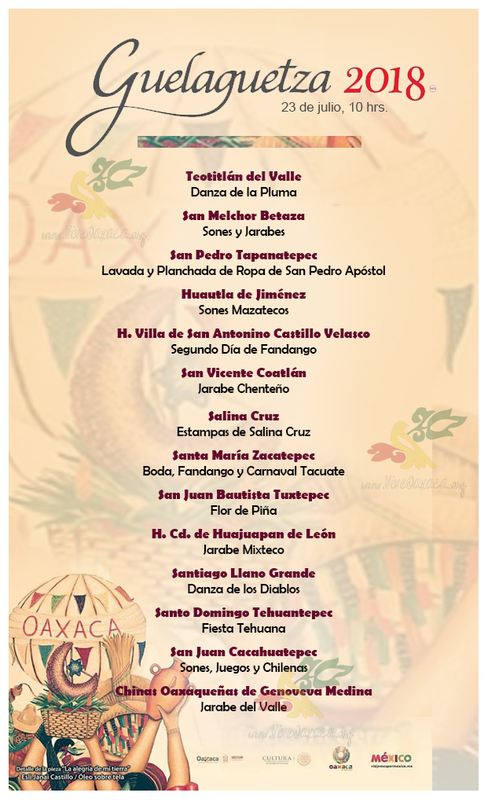 However, if you are not in Oaxaca, CORTV will also be streaming the 10 AM and 5 PM Guelaguetza performances live, this week and next. 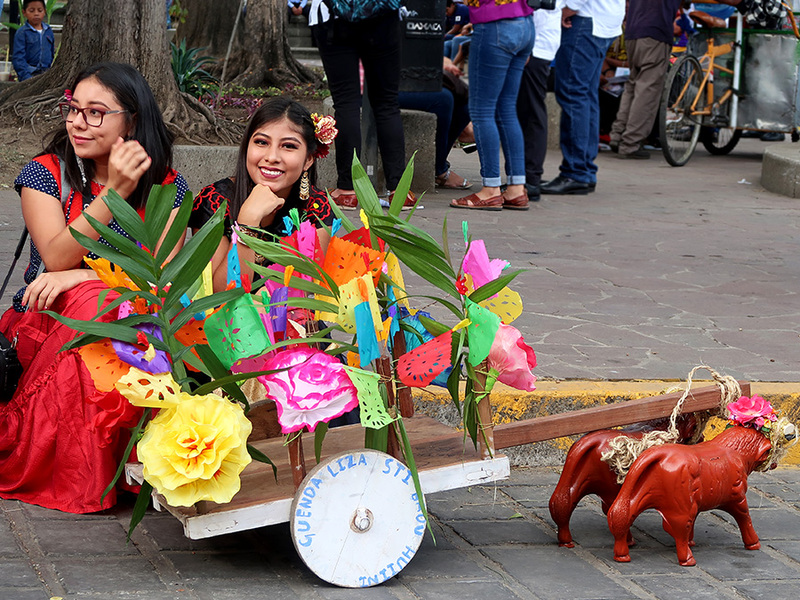 This post is really just an excuse to post photos of two young women who are presiding over this year’s Guelaguetza activities. 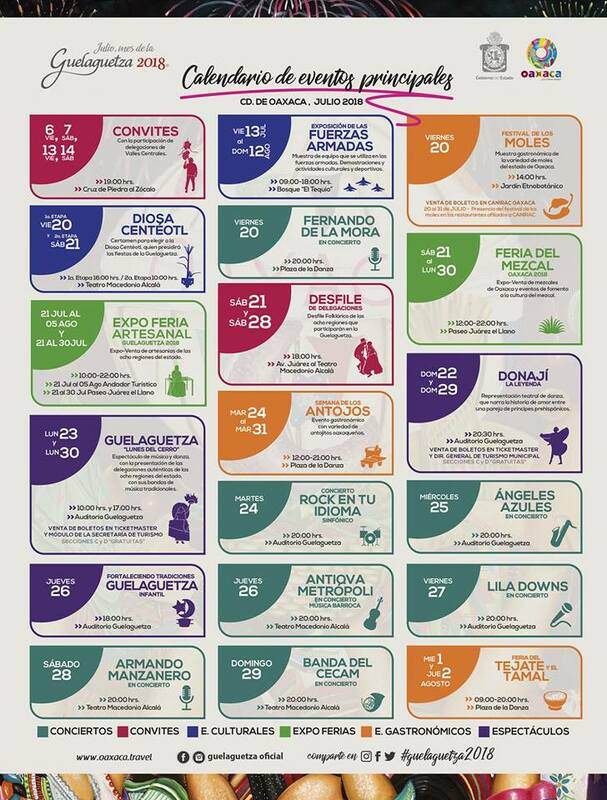 The first is the Reina (queen) of the 4th Expo Feria del Queso y Quesillo. She is a writer, loves books, and her eyes lit up (even more!) when I told her I was a librarian. She and her mother were so gracious and radiated joy and warmth. Alas, I didn’t catch her name; if anyone knows, please post in comments. 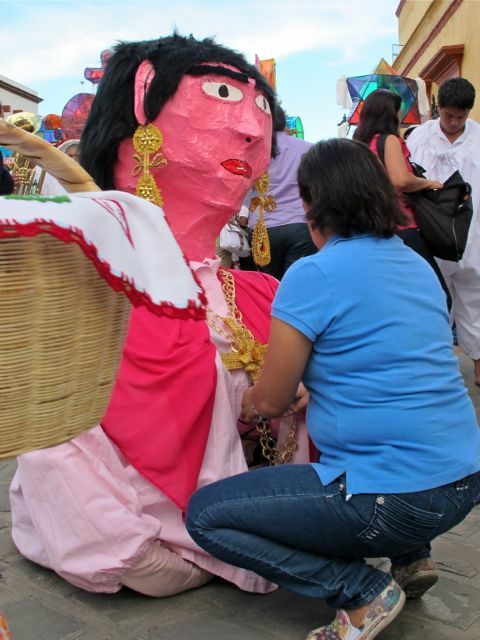 Friday evening, the Diosa Centéotl (corn goddess) was chosen to reign over this year’s Guelaguetza. 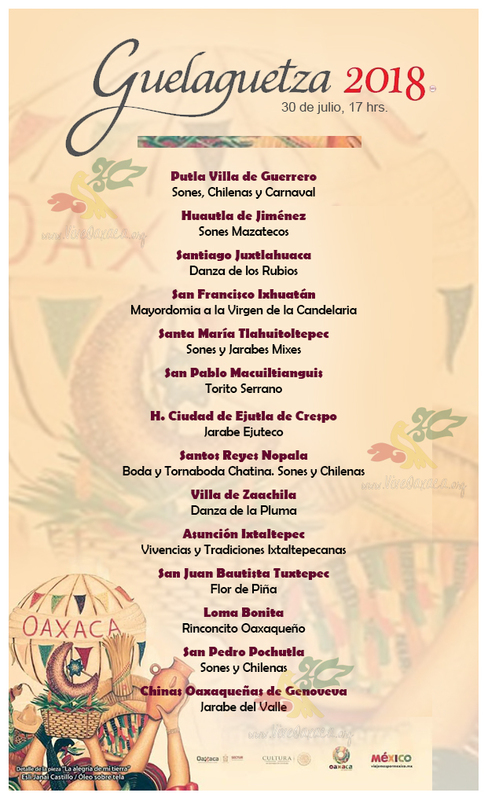 Jacqueline Reyes Rosario Sarabia, a native of Santo Domingo Tehuantepec, Oaxaca, was selected from 33 participants who represented the 8 regions of the state of Oaxaca in a 2-part competition. 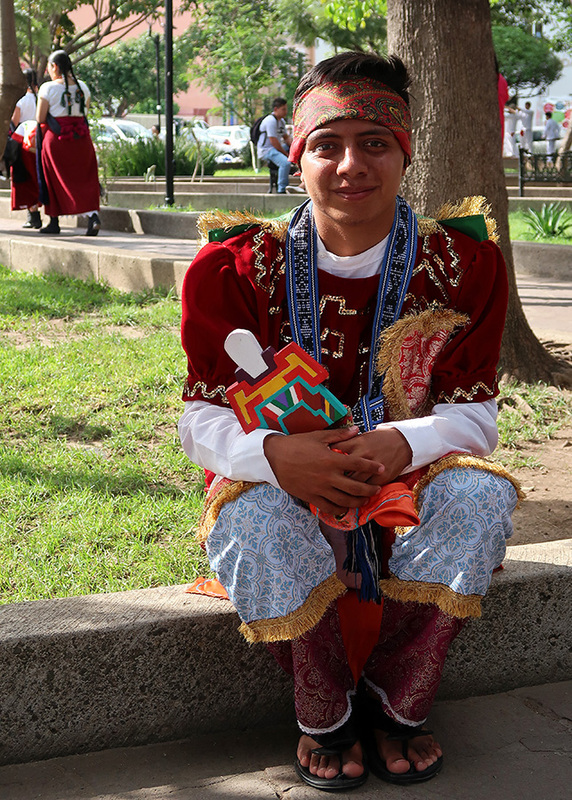 Each entrant was required to make a presentation, in both her native language and in Spanish, about the gastronomy, crafts, dances, legends, traditions, and customs of her village and on the clothing of her region. Even though we were way in the back, Jacqueline caught our attention with her impassioned speech. 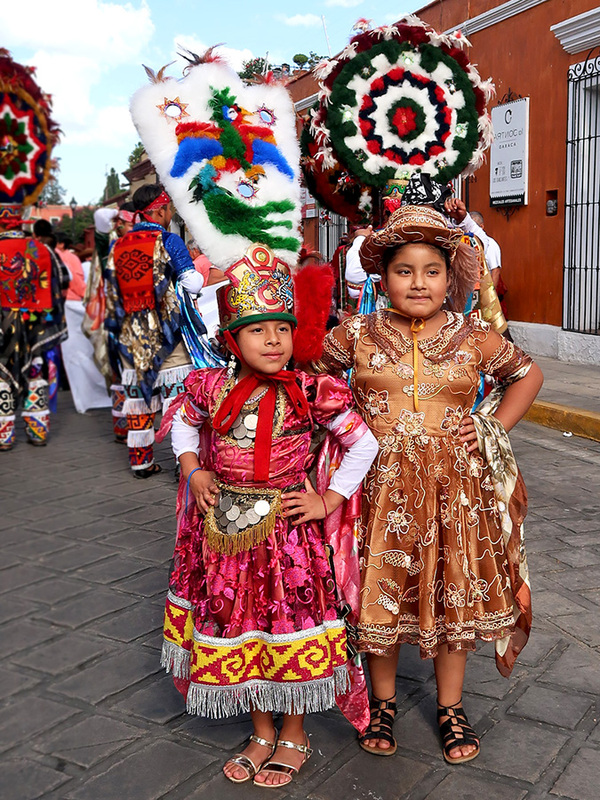 One of the first of her duties was to lead yesterday’s desfile (parade of the Guelaguetza delegations) through the streets of the city of Oaxaca. 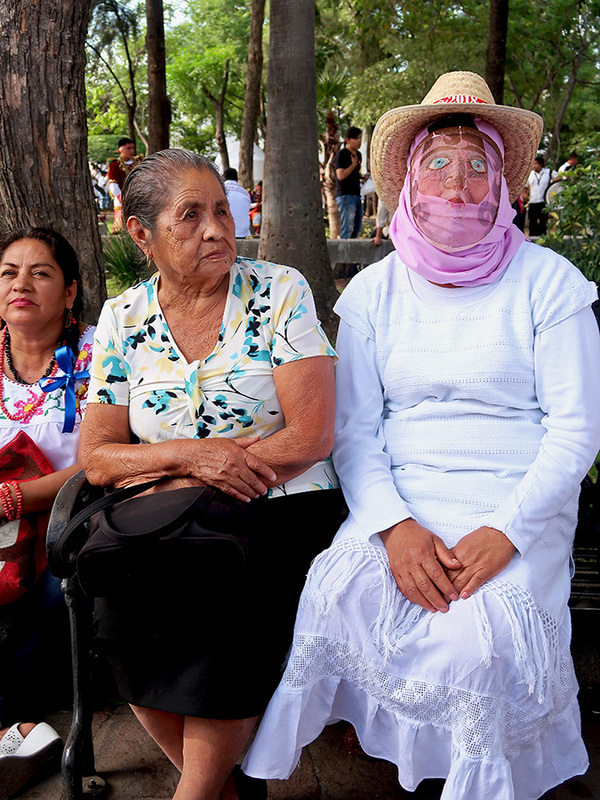 I love Jacqueline’s reaction when her name was announced as Diosa Centéotl 2014. 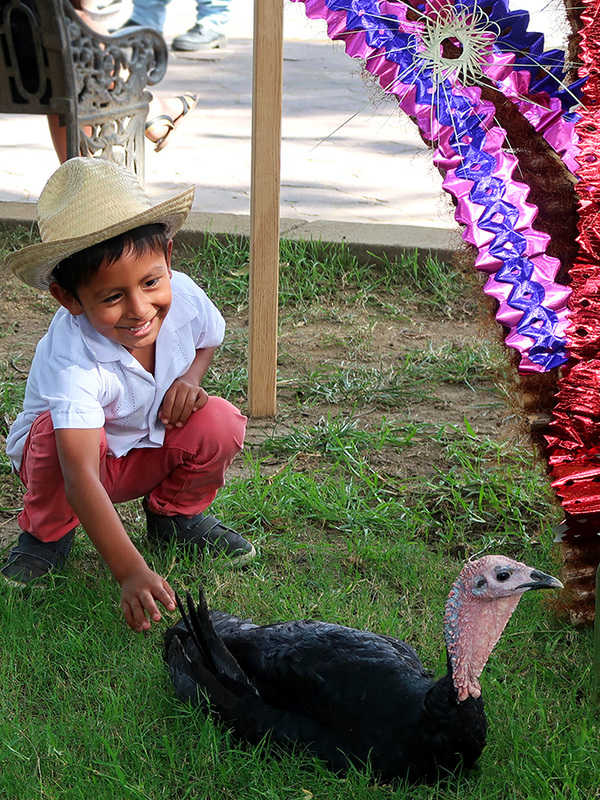 Wading through the 900+ Guelaguetza photos and wondering… Where do I start? Where do I stop? 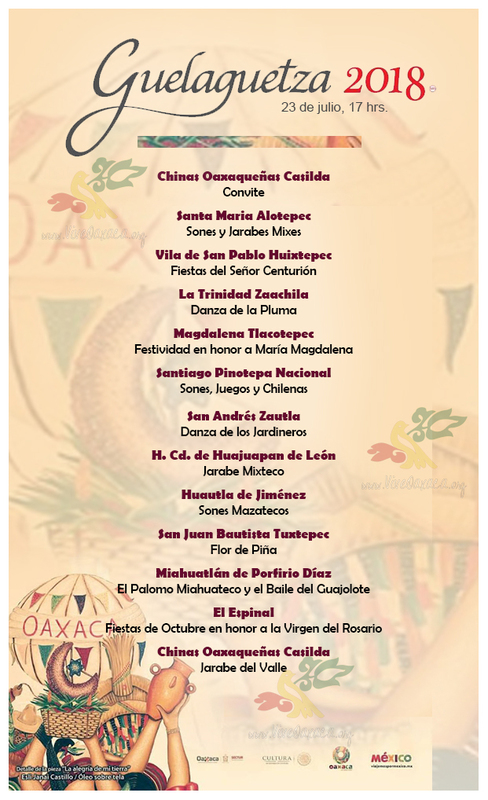 Today, it will be with two delegations from the Jamiltepec District in the Costa Region of the state of Oaxaca. 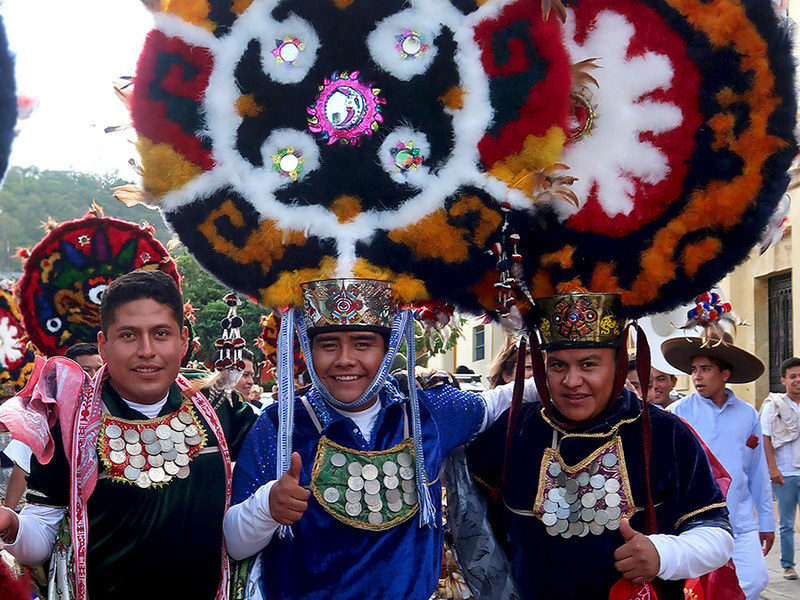 I begin with photos from last Saturday’s desfile of these fierce (and one not-so-fierce) looking guys from San Juan Colorado. 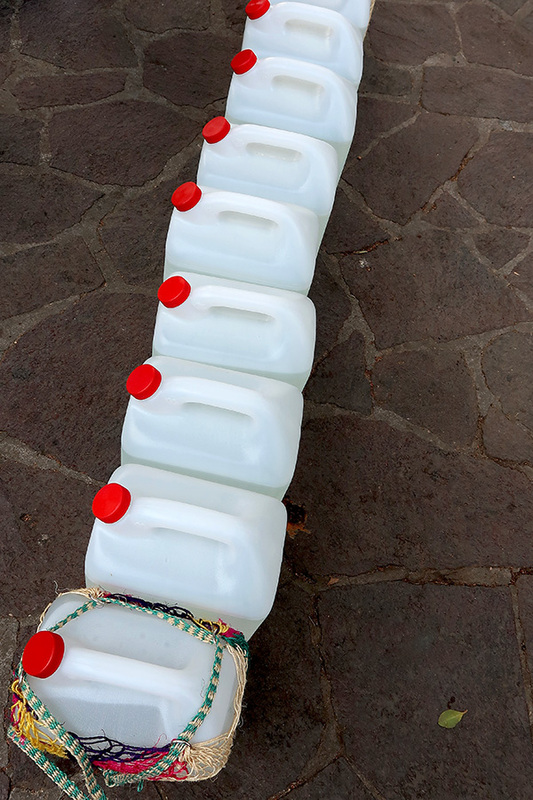 And, I will end this post with San Andrés Huaxpaltepec delegation. 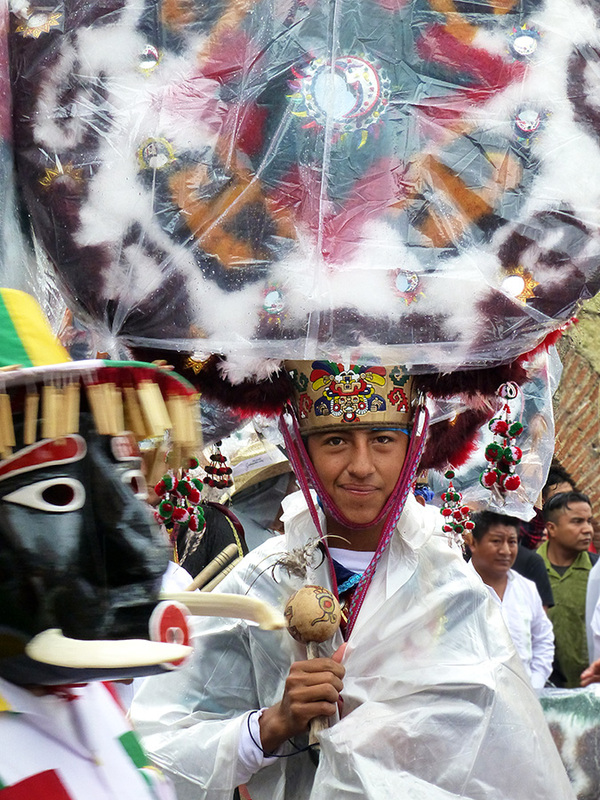 With the crowds that line the parade route and the contingent of family, friends, and aides (providing props and costume repair, along with much-needed water) that accompany each delegation, it was hard to photograph, let alone video, the dancing along the way. 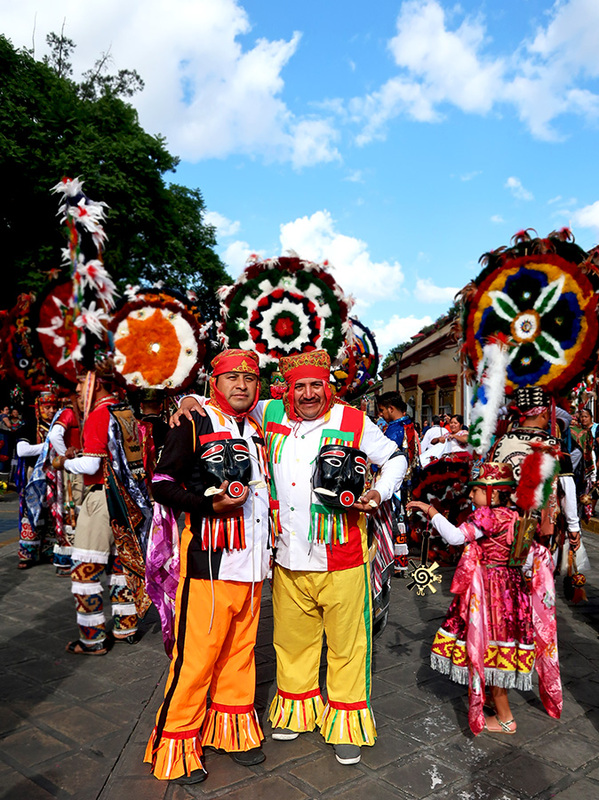 However, click HERE to watch a video of the La Mayordomía de San Andrés Huaxpaltepec from last Monday’s performance at the Guelaguetza Auditorium. 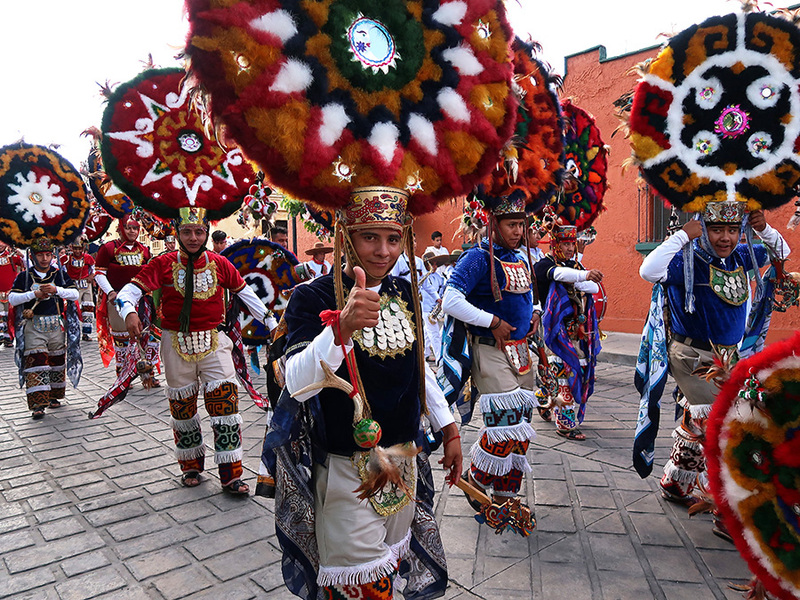 And, you can click HERE for a video I found of the Danza los Chareos of San Juan Colorado. 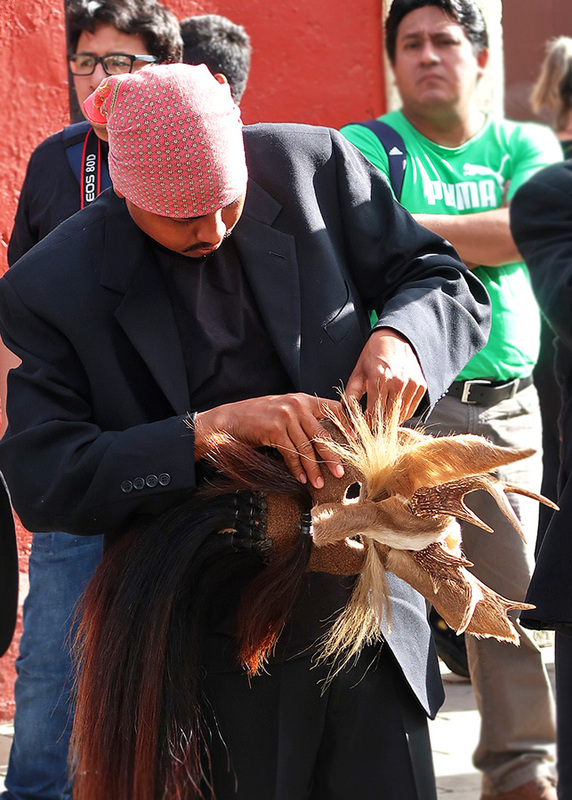 Finishing touches are put on costumes and canastas. 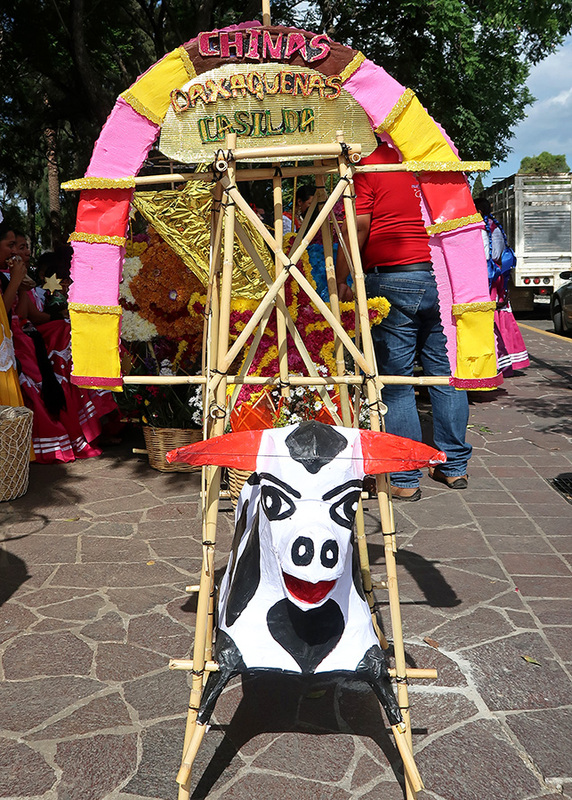 Adjustments are made to sandals and feet are rested before beginning the 3 hour procession through the streets of the city. We won’t ask what alteration she is making! Some of my closest friends have been (and continue to be) musicians. 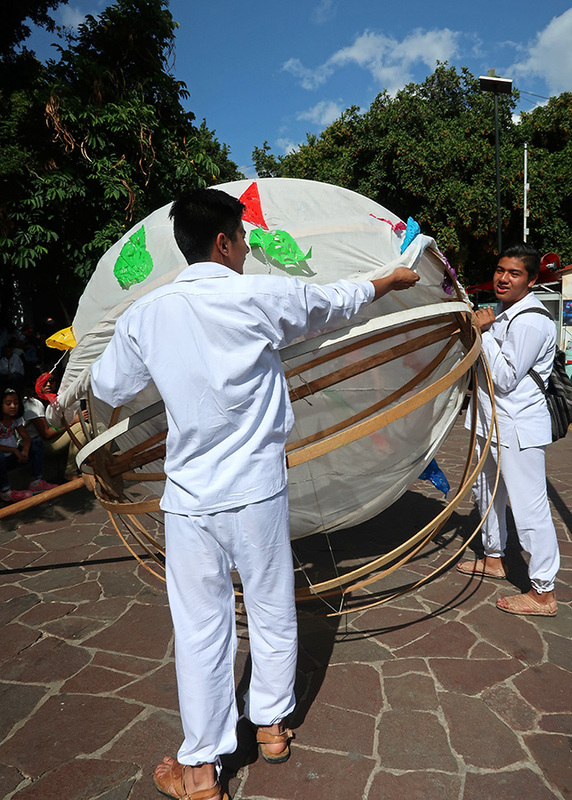 And, one of the things I find so appealing about Oaxaca is that music is everywhere and all the time. 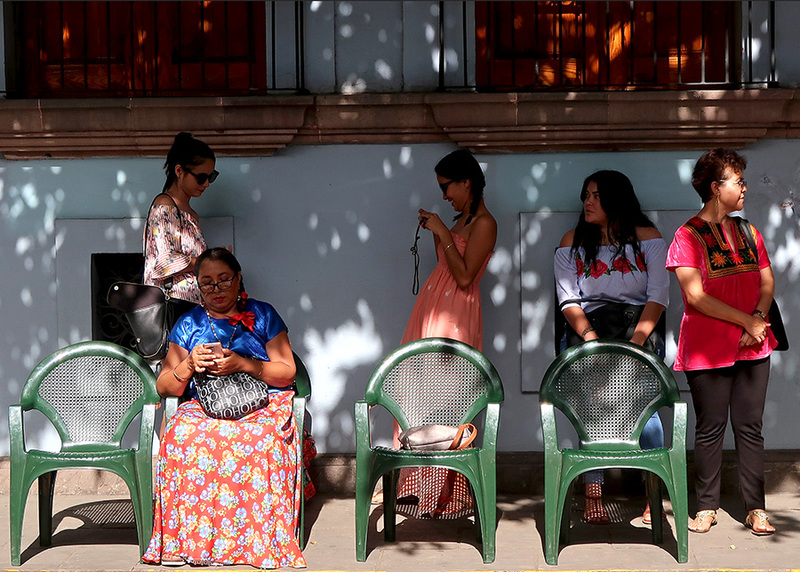 Marimbas are set up on sidewalks, accordions are almost ubiquitous, and free concerts occur weekly in the zócalo. Music is honored and valued as an integral part of the culture — a birthright. 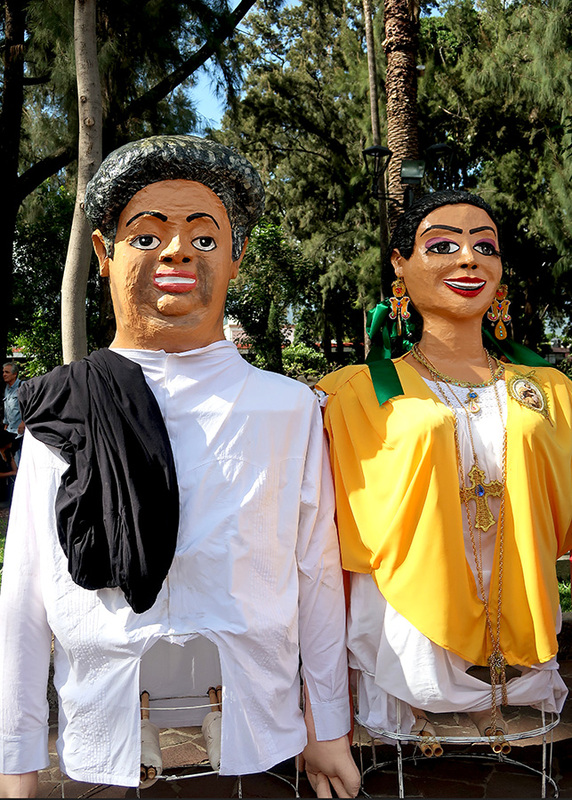 Each of the 8 regions of the state has its own distinctive “sones” and “jarabes” and they are tremendous source of pride. 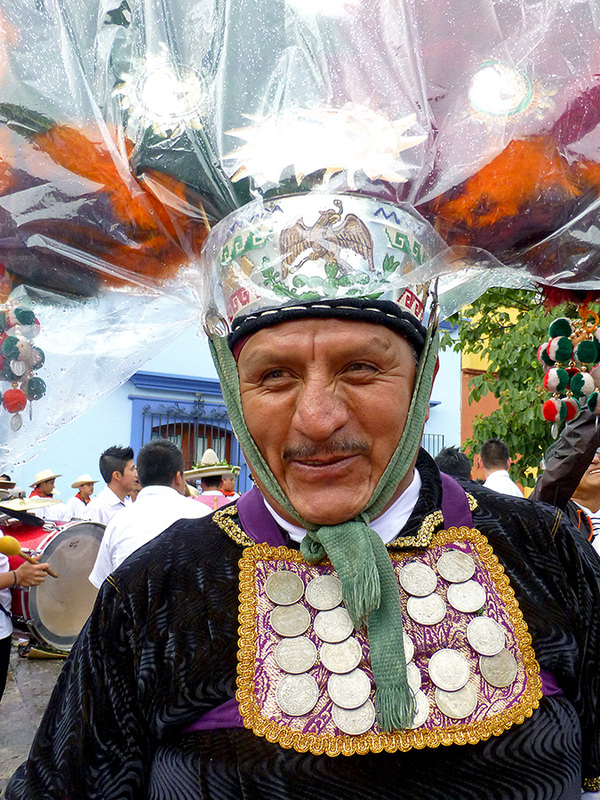 Within a bar or two of Pinotepa, Canción Mixteca, or any one of Oaxaca’s regional anthems, the clapping begins, tears may well up, and audiences of all ages begin singing the lyrics. 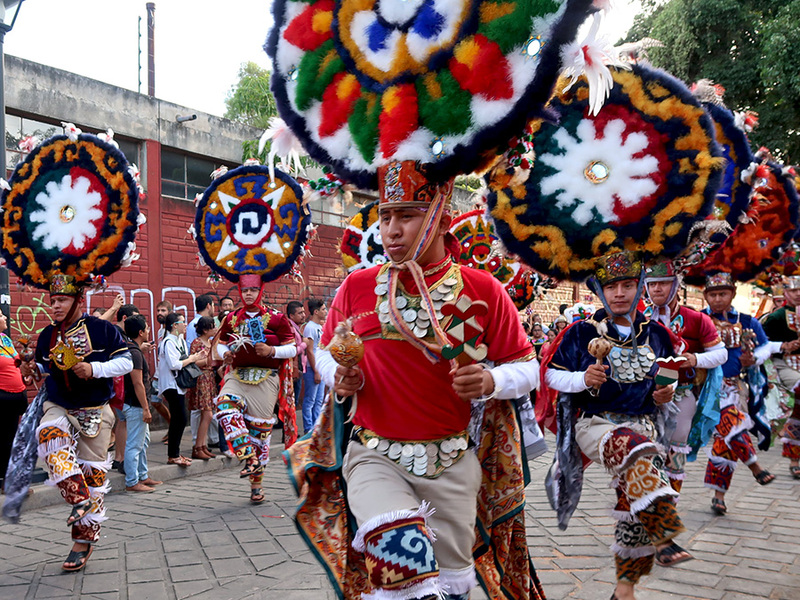 Thus, a major feature of the modern “Mondays on the Hill” that is Guelaguetza, is the performance of the music and dance of each of the regions. 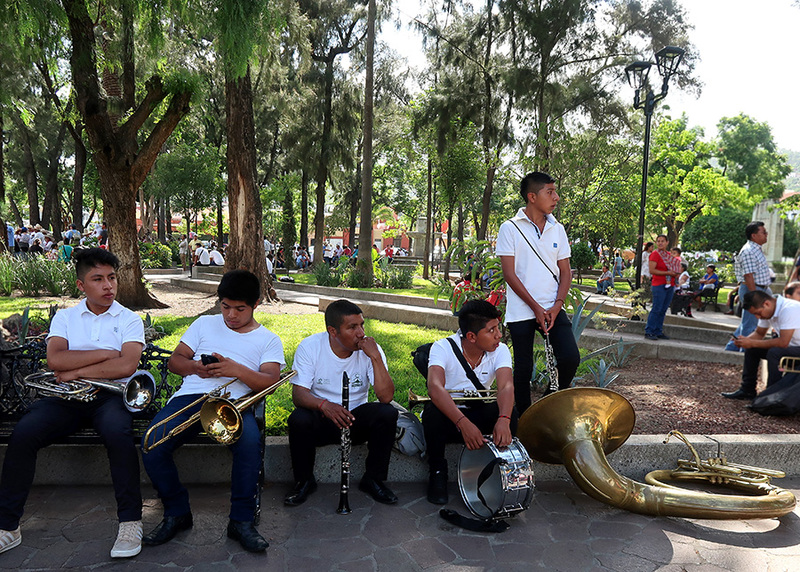 And, so I give you, some of the musicians who played almost non-stop for 3 hours, while their delegations danced their way through the streets of Oaxaca city during the last two Saturday evening Guelaguetza desfiles (parades). Here’s to the musicians, long may they play! 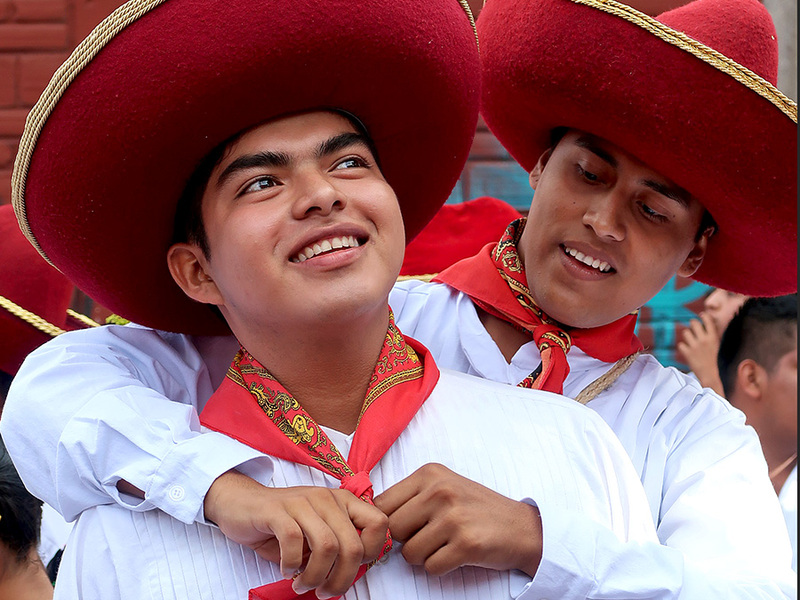 A slideshow from yesterday’s Guelaguetza Parade of Delegations.